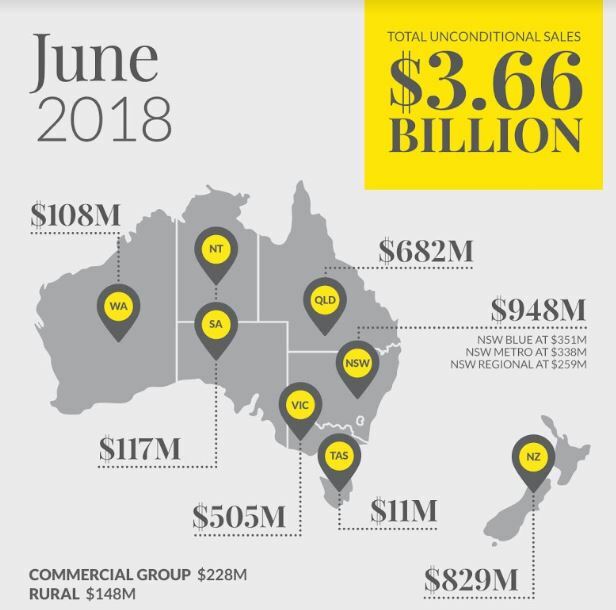 Our June results continued the trend of recent months, with overall sales of $3.66 billion across Australasia , representing an underlying decrease of 11% compared to June 2017. This fall is mainly due to reduced transaction numbers across the larger Australian east coast markets. Tighter credit conditions and less investor interest have been the primary drivers of weaker housing sales activity in Sydney and Melbourne, and to a lesser extent in south east Queensland. Buyers remain more cautious for these reasons, and there is less new stock coming onto the market than this time last years as many potential vendors take a ‘wait and see’ position. Daily press commentary proclaims that prices in these markets are ‘plummeting’ or ‘collapsing’, and similar with auction clearance numbers. Where is this happening? Certainly, some of those suburbs within Sydney and Melbourne that enjoyed spectacular price growth during the past 12 months have given back much of those gains. Perhaps up to five per cent? Even a bit more in some less established markets. But certainly not to a level to justify such headlines. Our group calls far more auctions than any other group, and our Australian clearance rates are healthy and in line with long term averages, though softer than 2016 and 2017 figures in Sydney and Melbourne. Paradoxically, subdued market activity is happening at a time when Sydney and Melbourne are experiencing record levels of infrastructure spending and population growth. And when interest rates are forecast to remain benign. And quite conversely, all evidence points to strengthening house prices and activity outside of these three Australian markets. In fact, our South Australians network had a personal best month in June. Western Australia had a strong June also, as compared to last year. And regional markets across all states experienced lifts in activity, and are still exhibiting strong value especially as compared to capital cities which is especially relevant for retiring baby boomers. Sales for our New Zealand network were slightly up on 12 months ago but down on last month. New property listings continue to be consistent with stock levels maintaining a balanced market for both buyers and sellers. The recent overseas investment policy has been under review by the Government and is expected to be more relaxed than when it was first introduced earlier this year. Looking forward market conditions remain slightly in favour of the sellers with continued small price increases and low days on market being maintained. Our NPS score remains very high at 79 as we continue to strive for the very best customer service for all our buyers and sellers. It was a strong end to the financial year for Loan Market, highlighted by the finance group being crowned Australia’s best Franchise Broking Group at the Australian Broker Awards. Their results were strong in June with $1.2B in lodgements, approvals stood at $850M and settlements at $810M. Loan Market chief operating officer Stephen Scahill said new records were also established with our own product – Loan Market Go.